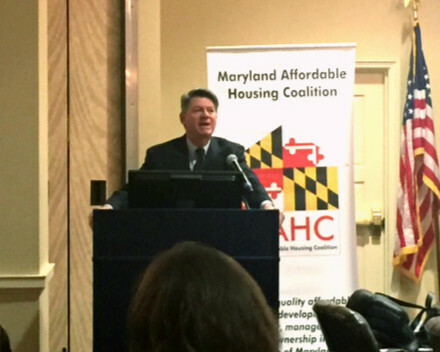 Secretary Kenneth C. Holt speaking at the 2016 Maryland Housing Day in Annapolis on February 18. Annapolis, MD – Creating affordable rental housing opportunities across the state creates jobs and stimulates the economy while providing quality, energy-efficient homes for families, senior citizens and individuals with special needs, said Secretary Kenneth C. Holt during remarks at the 2016 Maryland Housing Day event. The secretary said programs such as Rental Housing Works provide invaluable financial resources for increasing the supply of affordable rental housing in Maryland. Maryland Housing Day is an annual event sponsored by the Maryland Affordable Housing Coalition to remind lawmakers of the importance of affordable housing to the state’s economy. Members of the coalition include developers, contractors, lenders, investors, architects, engineers and property managers, as well as local governments, housing authorities and community organizations. The coalition is an alliance of more than 185 businesses and organizations involved in the affordable rental housing industry. Secretary Holt remains committed to expanding housing and community development opportunities through programs such as the recently announced Project C.O.R.E. Project C.O.R.E.’s holistic approach will create even more opportunities for affordable rental housing and support economic recovery in Baltimore City, Secretary Holt said. Speaking on the administration’s new student debt initiative, Secretary Holt described a unique plan to combine a potential home buyer’s student loan debt with their mortgage of a department-owned property, enabling monthly savings and increased accumulation of home equity. “Economic development is the keystone of the Hogan administration’s platform to change Maryland for the better,” Secretary Holt said.